Adventure Hub Nepal offer every trekking option in everest region so this are few packages and option you can pick from in our site, An ultimate challenge to the ambitious trekkers, this moderate to challenging graded trek takes to you to the foot of Mt. Everest traversing across the high Cho La pass at an elevation of (5420 m.) Also included is the opportunity to trek to the summit of both Gokyo Ri (5340m.) and Kala Pattar (5554m.) 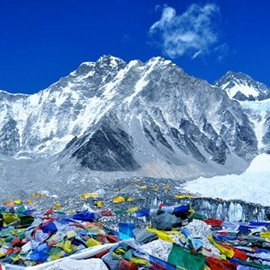 for magnificent views of Everest, Lhotse, Nuptse, Makalu and Cho Oyu . A visit to Everest Base Camp will give you the chance to have a closer look at the spectacular Khumbu Icefall. Start your adventure with early morning pack breakfast and short drive to kathmandu domestic airport for fly to Lukla which is 30-minute flight to Lukla (2804m). On arrival at the airport Adventure Hub Nepal guide will brief us and introduce our porters and have short break or hot drinks before we begin our trek towards Phakding (2610m) which will be around 3 hours. from Phakding today we will ontinue our trek towards Namche Bazaar, which is at an altitude of 3535m and will stay night here acclimatise and walking hours is around 5. Known as the Gateway to Everest·we will spend today here in order to acclimatise and adjust to the thinning air. As well as in the morning, we hike upto to museum celebrating the traditional customs of the Sherpa people to visit. More importantly, from here you will get the first proper glimpse of Everest and the surrounding mountains. And at the afternoon, we hike up the Syanboche Airport, and Everest View Hotel and sightseeing at the Khumjung village,which is big settlement of Sherpa people and 5 hours trek. Today with early mornin nice and warm breakfast will start our trek to Machchhermo which is around five hours but its always depend on the how people walk , stay night at Mchchhermo. Dole to Machchhermo (4470m/14751ft.) 5 hours. This momnet every one been waiting for long time see this wonderful lake right up close and will stay night here. Hiking to Gokyo Ri and back to Gokyo Lake. This day early in the morning we have steep climb up to the top of Gokyo Ri (5483m/1983ft) ample rewards to one attempts this trip. There are stunning views of the supper Gokyo valley, the massive Ngozumpa Glacier and an incredible panoramic view of the whole Khumbu Himalayas, such as giants as Everest, Lhotse, Nuptse, Makalu (8481 m), Cho-Oyu (8153 m) and Gychung Kang (7922m) can be seen. Those who explore the glacier and Gokyo peak are rewarded. This Day we have for acclimatization and after noon back to the camp. After spending at Gokyo lake for night will then trek back down to Dole where we past before and as we come down you will enjoy the breath taking view of this valley. walking time will be around five hours. Todau is our second last day on the trek we like to late people enjoy more and more as you walk down to Tenbuche which you can enjoy the view off lifetime, walking hours today around five. After early morning breakfast will trek and i am sure you have enjoy the what you seeing in everest region has to offer you, walking today is around five hours. Trekking from Namche Bazaar to Lukla is last day for us and you we better enjoy what we left behind us and what we seeing, walking time and distances today is around five hours. Today we say good bye to Khumbu disrict and Everest region, after early morning breakfast will then walk five mintue to Lukla airport for catch flight to Kathmandu which 30 mintue flight.